Bosham had a hard end to a tough campaign when they lost 5-1 at home to champions-in-waiting Rustington. Walton Lane was packed to the rafters to see the home side pit their wits against the confident Blues. Josh Irish gave the visitors hope of an early lead with a stirring effort that only just cleared the bar during a fairly even first quarter hour. Bosham found it hard to create meaningful chances at the other end of the park although both Nick Edgington and Alex Barnes were a handful for the Blues defence but didn’t trouble keeper Binny Nash. Bosham were holding the visitors and playing encouraging football which entertained the crowd but close to the half-hour their good work was undone when Rustington got their noses in front. A ball was delivered into the Bosham penalty area and Kris Parafix controlled it superbly and, on the turn, stabbed home on the volley past the dive of Harley Redman. Bosham dug in but their efforts went unrewarded and before the interval the Blues took a two-goal lead through the dangerous Irish. A moment’s miscommunication between Redman and Harry Spicer gave Irish all the impetuous he needed to steal in and prod the ball into the empty net. Following the restart George Briance bought a stunning save from Nash as the Robins looked to get back into the tie. Rustington weren’t about to rest on their laurels and a few minutes later had a third to celebrate as a swift counter attack resulted in Tom Ryder sliding the ball past Redman to further Bosham’s woes. 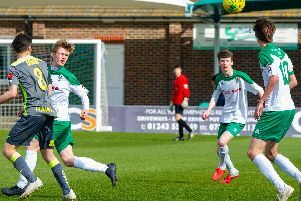 Is play-off dream over for Bognor? The Robins continued the battle and Harry Nightingale showed great strength and pace to bulldoze through the Blues defence only to see his shot well saved by Nash. Just after the hour Bosham got the goal they needed through the reliable Edgington. Following excellent work from Ben Bishop, Edgington let fly from 20 yards into the roof of the net. This seemed to re-awaken the Blues, who added two more to their tally before the end to finally bring down a tiring Bosham side. Chris Darwin got both as the home defence was torn apart, with Darwin first on hand to slam home after another defensive mix-up and then on the end of a superb low cross from Gary Peters. Bosham could come off the pitch with heads held very high after more than matching the Blues from long periods but experience and quality eventually won the day. Bosham have finished their season and will look forward to the close season and a chance to build in readiness for a new campaign and a fresh challenge for honours. Bosham: Redman, Jarrom, Metherell, Clark, Edgington, Barnes,Bishop, Briance, Crabb, Spicer, Nightingale. Subs: Terry, Rustell, Redman.